We have found that many homeowners and business owners have the same question. They want to know “How to make my Aluminum Fencing more Private.” Well, there are actually a few ways, because there are two styles of aluminum fences. Aluminum Fencing: Aluminum fencing is a great way to provide security and enhance your property without the maintenance of wood or wrought iron fencing. But what about privacy? Aluminum fences tend to be pretty wide open. 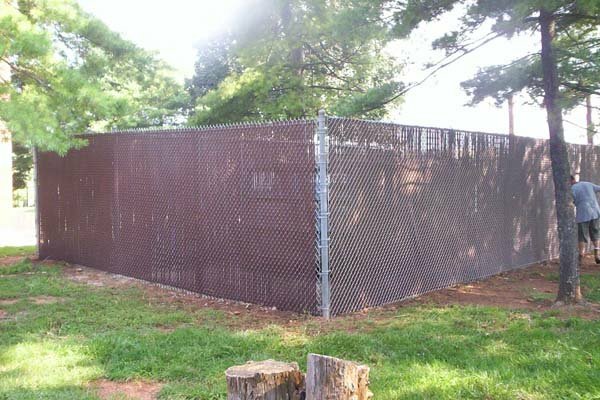 Aluminum Chain Link Fencing: Chain link fencing is among the least expensive ways to fence in your property. However, it is also not very private. At least, not at first. Vinyl Privacy Slats: For more privacy you can install vinyl slats. These are available in a variety of colors. Plant Bushes: For a more aesthetically pleasing solution, consider planting bushes and trees along your fence. However, this will require annual maintenance and pruning. With 40 years of experience, Freedom Fence and Home has built a reputation for building the highest quality fences throughout Baltimore and Harford County, Maryland. Aluminum Fencing: We offer an industrial grade aluminum that has the strength of steel. This high strength alloy is 50% stronger that other aluminum fences and uses a locking system requiring no screws. Our aluminum fencing is available in black, bronze, green, and white. Aluminum Chain Link Fencing: Our chain link fences are available in galvanized, aluminized and vincoated. Vinyl coated fences are available in a wide range of colors, including black, green, brown, steel gray and white. Furthermore, our chain link wire is available in a variety of gauges or thicknesses to suite your needs. At Freedom Fence & Home, we provide a high quality wood, vinyl, chain link, and aluminum fences and we stand behind our work. So why would you call anyone else? This entry was posted on Tuesday, March 19th, 2013	at 5:59 pm	. Both comments and pings are currently closed.